The Minnesota Museum of American Art is one of the oldest visual arts organizations in Minnesota, with roots stretching back to the 19th century. Founded in 1894 as the St. Paul School of Fine Arts, the Museum was formally incorporated in 1927, when it began collecting works of art for instructional purposes. In the 1940s, the Museum began assembling an esteemed collection of paintings, work on paper, sculpture, and craft. Beginning in the 1950s, under the name Saint Paul Art Center, the organization pursued a robust program of exhibitions—including biennials of drawings, craft, and contemporary art. Renamed the Minnesota Museum of Art in 1969, it became a leading presence on the Twin Cities art scene through educational programs and nationally regarded exhibitions. In 1992, the Museum added “American” to its name to reflect its increasing focus on national and regional art and the changing nature of the American experience as seen through the visual arts. 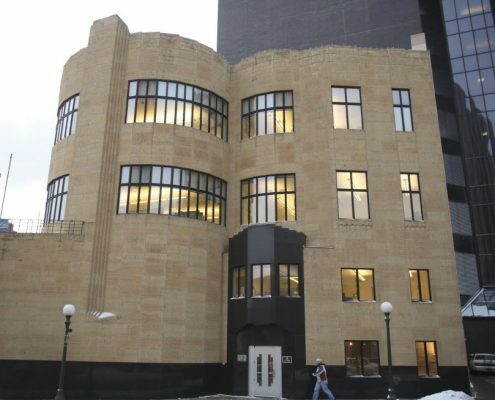 The Museum has been housed in a variety of St. Paul locations throughout its history, including the Jemne Building, Landmark Center, West Publishing Company on Kellogg Boulevard, and now the historic Pioneer Endicott building. Today, the Minnesota Museum of American Art holds more than 4,500 artworks that showcase the unique voice of American artists. Guided by the belief that art should reflect the constantly shifting landscape that defines the American experience. Our responsive exhibitions connect diverse audiences with subjects and issues that are relevant and engaging. We listen intently to the diversity of voices in our community, learning from our exchanges with those we work alongside. The Museum is led by Dr. Kristin Makholm, a respected curator and art historian with deep roots in Minnesota whom the trustees hired in 2009. Under her leadership, we opened the Project Space in 2013. Exhibitions in this 3,000 square foot gallery in the historic Pioneer Endicott earned the museum the “Best Museum in the City” award from City Pages in 2016. We continue to organize “on the road” exhibitions and art engagements that bring the collection and programs to audiences throughout the Midwest. In addition, we offer interdisciplinary programs, classes, and community partnerships for all ages that invite direct access to artists, art, and making. As our innovative programming and connections with new audiences grow, we at the Minnesota Museum of American Art think it is time for a user-friendly acronym that accurately captures our dynamism and future plans: “The M.” It stands for Museum and Minnesota, the bedrock of what this has been about for more than 75 years. But it’s also about a fresh and exciting future as a partner in the cultural vitality of St. Paul, a capital city booming with entertainment, restaurants, and music. With an unparalleled commitment to local artists, we will constantly strive to celebrate the talent that is immediately available to us in our local community. Above all, the M will contribute to what makes a community healthy and strong: accessibility, openness, and connectivity. Countdown to Our Grand Opening!